Can You Help Me Find My Worm​ is a street­-art influenced flyer project. 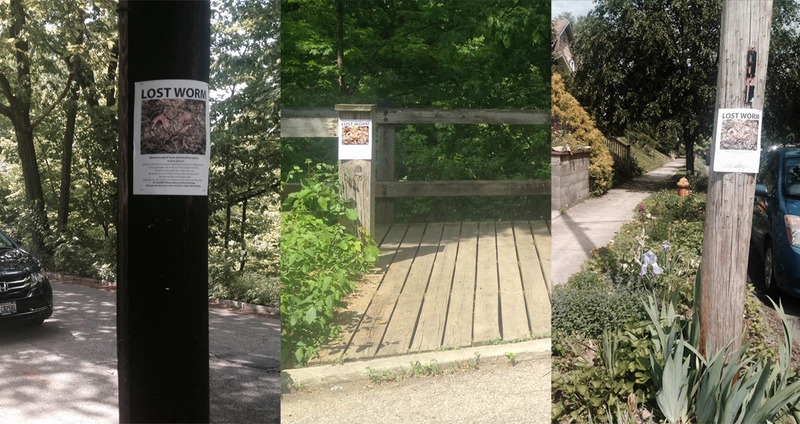 There are over 15 “LOST WORM” flyers posted on street poles in various neighborhoods from central to southeastern Ohio. Using absurdity, humor and the most basic technique to find a lost pet, the flyer asks the reader to consider a potential relationship between humans and worms while sharing positive aspects of keeping worms (eg. they will eat your garbage). Flyers are posted on common dog­walking routes in my neighborhood. Many people that have companion animals will read “lost pet” flyers and hopefully be amused by the absurdity. The flyer provided a bit.ly shortcut to building your own worm bin on instructable.com. The project can be qualitatively assessed by linking Google Analytics to the Instructable article and tracking the bit.ly as the referral source. Designed for urban agriculture, indoor and outdoor growing of herbs, leafy greens, house plants and ornamentals. Outdoors they are attached to rainwater barrels, collecting roof runoff and automatically watered with timers. The Cascading Growbags Vermiponic Wormbag uses live worms to convert organic compost into nutrients which are then fed back to the plants through the watering system. Using the Vermiponic Wormbag in this system allows the worms to create organic worm castings from your kitchen scraps, which then becomes worm tea in the rain-barrels. This nutrient rich water is then fed to the plants through the watering system which allows for fully organic growth of healthy food. – more info and purchase info on Cascading Growbags site.